All over China, thousands of children are being groomed in specialized schools for the highly refined sports of gymnastics and diving. These are fields in which Chinese athletes excel. Each delicate move represents years of hard training. But behind the glamour and medals, there are countless stories of sacrifice and failure. To thousands of people in Hong Kong, home is a unit of these temporary housing areas. The government had indicated that relocation to permanent housing will be completed by 1997, but to residents, the fight for improved living conditions continues. And that remains as a concern for the younger generation as well. 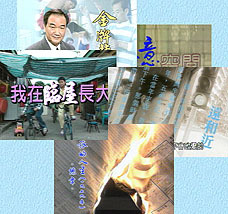 "Book Flash" is a series of 5-minute programmes on Hong Kong literature of different genres such as poetry, prose and fiction. It is hoped that literature will be made accessible to the general public in the form of visual images. It is about the return journey of a man who used to live on the boat and has been away for 15 years. The author is reminded of some moments in the past by the exhibits in front of her eyes. In "The Lunatic", people's remarks about the lunatic man reminds Xiao Si of those who might look impressive but actually lack real worth. She comments this kind of people sarcastically. In "At the Museum", the author is reminded of some moments in the past by the exhibits in front of her eyes. The poet was driving all the way from Shatin to Kowloon, and had to pay one dollar toll for crossing the Lion Rock Tunnel. Though it was something mundane, the poet explores its implications and reflects people's ambivalent attitude at the time towards the handover of Hong Kong to China. A record of the poet's observations about the pomelo. According to the poet, to enter into the spiritual realm of the pomelo, one needs to go beyond the superficial and employ an alternative perspective. Ye Hui gives a very detailed description of Shau Kei Wan and those places he has once lived in. It is about what the author saw one early morning in the streets near the North Point Pier. The author blends his observations about China in his depiction of the scenes at North Point, and thus projects a much wider world in the poem. It is about the communication breakdown over certain issues between a father, who came from China, and a son, who was born in Hong Kong. "City Feeling" includes three of Luo Fu's proses "Victoria Park in Ten Years", "Autumn's Sunlight" and "Life is But A Journey". They are all about city life and culture he observed in Hong Kong. This is a collection of excerpts from a Monday evening programme, "Hong Kong Spirit - Mutual Help Resources Centre", which demonstrates how radio plays an interactive role to promote social awareness of poverty, needs of the underprivileged and mutual help in the community.